Whether you are departing or just arriving at Long Beach Airport you can find the many different areas of the airport when you are visiting. Centrally situated, but less crowded than LAX, Long Beach Airport offers a calm window into Los Angeles County that rarely gets seen by travelers. Enjoy the California sun by making sure every step of the way runs smoothly, whether it be the food you get the moment you step off your flight or the perfect accessory that makes your outfit pop. Long Beach Airport offers many services that not only make visitors welcome, but those that live in the surrounding area as well. The facility started a Green Airport Program, which is dedicated to minimizing pollution as well as innovation with new technologies. The airport also offers simple pleasures like 24-hour paging booths, digital check-ins, and complimentary Wi-Fi, not to mention Festival of Flight, an annual celebration that brings local music and eats to travelers. There are two main parking lots located at the airport. 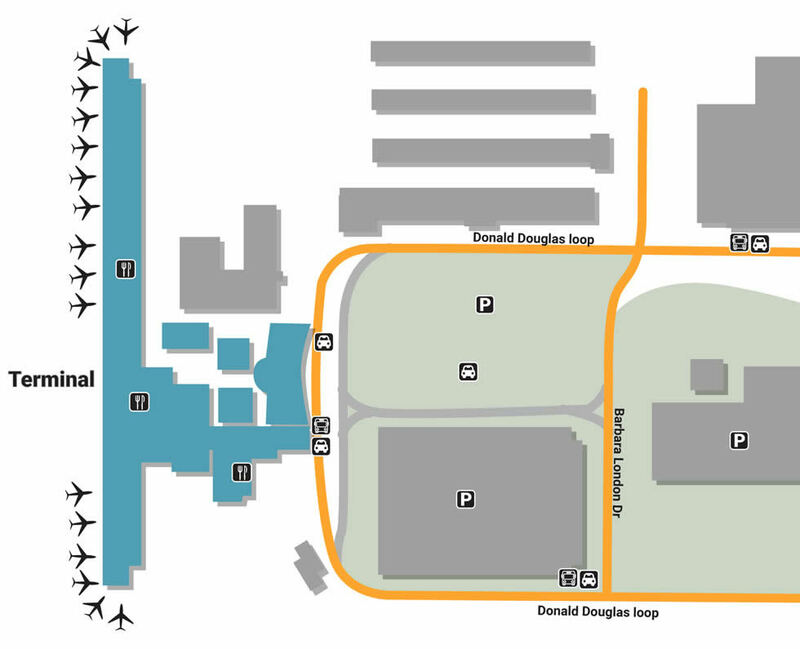 Parking Garage A is located across the street from the main terminal right next to the taxi kiosk. Drive a bit further away from the terminal down Donald Douglas Loop for cheaper daily parking as well as an economy level within the garage. If you’re just picking someone up, park for free at the Cell Phone Lot, located on the corner of Lakewood and Wardlow. As one of the smaller facilities in the state, LGB is a small vintage strip that’s home to only a handful of shops that make up a well-balanced collection of needs and wants. Visit Long Beach News by the terminal on the first floor for candy or interesting reading material, or enjoy an afternoon round of golf at Skylinks, an on-site golf course with a layout designed to unwind. Though there aren’t many stores throughout the facility, there are quite a bit of restaurants to choose from. Enjoy a variety of local eats, from the vineyard-fresh wines of 4th Street Vine to the super-sized burritos and nachos at Taco Beach Cantina, both of which are located in the North Concourse food court. If you’re in the mood for Greek, walk over to George’s Greek Cafe, a staple of the area for over 30 years, or enjoy fine dining at the sit-down restaurant, Boathouse on the Bay, a small eatery that serves steak & seafood with seasonal twists.